My programs give you practical steps you can implement right now to shape the future of your community. My advice is based on my real world experience as a small town store owner and cattle rancher. I don’t just talk about rural issues; I live them. As selected by a group of small business experts and online nominations. Quite an honor, considering the competition included many much more "well known" people. Honored in the Northwest Oklahoma Region, nominated by the local Small Business Development Center for our work together on Entrepreneur Days throughout the region. A Community Choice Winner in 2013 Small Business Book Awards, Small Biz Trends. Becky agreed to co-host the 1st Live #Blogchat event at South By Southwest. I threw Becky quite the curveball, as I asked her to join and help facilitate the discussion and flow at this event with only a couple of hours notice. But I did that because I knew that she could handle the event, and she did so flawlessly. 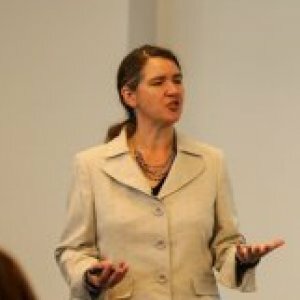 Becky is a very polished yet completely natural speaker, and that resonates with her audience. She was a star of our event, and a huge reason why it was so successful. Becky’s ability to connect the changes in today’s business world to small town rules is phenomenal. When she speaks, you can see the light bulbs going off in the audience as they collectively nod their heads. Becky McCray understands community and seamlessly becomes a part of any audience she encounters. More than just a speaker, Becky is a valued partner and an asset to me as an event organizer. That Becky McCray knows her stuff. Our AMAOKC surveys indicate she was EXTREMELY well received! I have a sneaking suspicion that you could talk about anything and make it seem interesting. Outstanding guided brainstorming session today with Becky McCray. She got the entire room to start thinking about working together, sharing our passions and supporting local businesses. Everyone left with a list of things they could go back to work with and install right away. So much better than a one hour lecture and more empowering as well. By the end of the week, I saw businesses changing their marketing, starting to work together, cooperating with the local paper, and a few new people starting to work with the Chamber. Consistently audiences rate her highly and go away energized and excited to tackle their business dreams, and always wanting more. She continues to be one of the most valuable resources I have found for small business! Rural Sourcing: how big city companies are rural sourcing instead of outsourcing, turning to small town service providers for their lower cost of doing business. 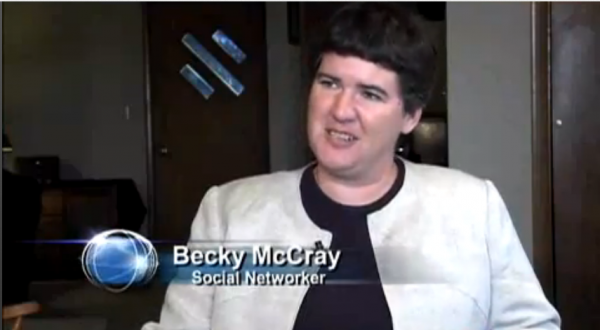 Social media expert Becky McCray says the key to success on the Web can be found in any small town. 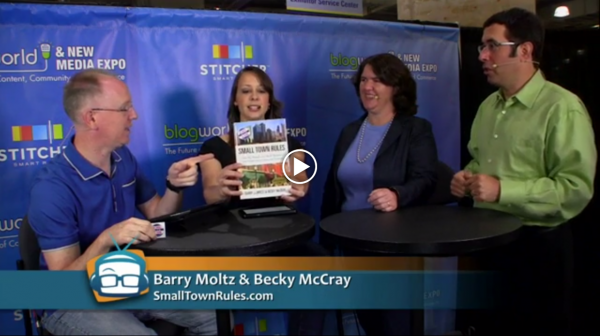 Cali Lewis and John P interview Barry Moltz and Becky McCray about their new book "Small Town Rules" at Blogworld 2012. Do small towns have a future? Panel with Liz Strauss, Terry Starbucker, Dave Taylor and Simon Salt. Panel on Multiplying Your Online Reach with Jen Risley and Emma Wilhelm, and presentation on Creating Your Business’ or Organization’s Biggest Fans. National Summit on Rural Entrepreneurship Washington, D.C.
Public Knowledge Policy Panel Washington, D.C.
All your life, you’ve been told that small towns are dying, drying up, and disappearing, and that there’s nothing you can do to change it. What you don’t ever hear is the good news. Big trends are moving in our favor: brain gain, changing retail dynamics, new travel motivations and more. Learn why we have a future and how to shape the future of your town. Rural audiences love this topic because it is a breath of fresh air: the good news about small towns! Too often, small towns shoot down ideas with “We tried that once” or “That’s not how we do things here.” But massive changes in the economy, technology and society mean small towns must change or die. Since we can never go back to the way things were, how do we start from here and go forward? Learn the practical steps you can take to change attitudes, improve the environment and create more connections, whether any of the old guard are ready to change with you or not. This topic shakes up old ideas about small towns. Audiences leave feeling more optimistic because they see exactly how they can shape a better future for their town. Shifts in the global economy, new technology and changes in society have made the business world much more like a small town, refocused on local businesses and communities. We’re hungry for a return to business and life on a human scale, and 21st Century leadership means relearning the practical principles that small town businesses have been using for years to succeed even in the worst hard times. If you want a topic that appeals to a broad range of people, this is a terrific choice. Your messages are being lost in the ocean of information. How can you get your important communication through? How can you market, advertise or advocate when no one is listening? The answer is in this practical system for stepping up the engagement and layering the details that you can put into practice in your very next email, update or printed material. You’ll create valuable messages that get through and get remembered. This is an excellent topic for tourism-related businesses.